Home to several architectural marvels, Gujarat is famous for its vibrant culture and rich heritage apart from the scenic landscapes and mouth-watering cuisine. Offering a broad range of the most spectacular attractions, Gujarat, also known as 'The Land of Legends', presents a perfect blend of art, history, music and culture. Being the sole home of the pure Asiatic Lions, the Gir Forest harbours a rich diversity of flora and fauna. Gujarat offers scenic beauty from Great Rann of Kutch to the hills of Satpura. Apart from picturesque landscapes and long stretches of coastlines, the ancient cave paintings, historic murals, holy temples, historic capitals, wildlife sanctuaries, beaches, hill resorts, fascinating handicrafts, are totally worth seeing. The cultural exuberance of the people of the state will give you a rejuvenating experience. Very well connected domestically and internationally by road, rail and air. Highly industrialised cities with modern amenities. Varied types of destinations suitable for all. It has now become commercialised and sees a large number of tourists in peak season. Alcohol and non-vegetarian food are banned in this state which may discourage some visitors. The vast number of natural habitats are excellent for the nature lovers while ancient ruins dating back to over 4000 years, temples and palaces will attract the history buffs. The cities are beautiful and ideal for sightseeing. The father of our nation, Mahatma Gandhi was born in Gujarat and returned to his land to propagate his philosophy. As a result, Gandhi and many of his followers have built ashrams and monuments to his name that are popular with tourists wanting to get a peek into the life of the man responsible for India's mass movements. His birthplace, Porbandar has been developed as a tourist destination and has a museum chronicling his deeds. Dandi, where he led the famous Dandi March also lies on the coast of Gujarat. Kocharab Ashram near Ahmadabad was one of the first Ashrams set up by Gandhiji, and till today retains the relics, he used in his daily life. Sabarmati Ashram, also known as Gandhi Ashram, is a destination that every Indian must visit as the ideas of Swadeshi and khadi germinated here. The history of Gujarat dates back to the earliest civilisation in India - the Indus Valley Civilisation. Several major cities from this period were located on the coast of Gujarat and flourished because of trade with the Persian Gulf. Today, the sites of Lothal, Dholavira and Gola Dhoro offer some of the best-preserved ruins of this period. There are old sigh boards, ingeniously designed sea ports, ritual tanks and cities that are protected as world heritage sites. Gujarat was also a major city for various large empires and has palaces and forts from different eras like the Lakshmi Vilas and Vijay Vilas Palace, the Tomb of Ahmed Shah, Prag Mahal, Shaking Minarets and many royal bathing houses called Vavs. The Surya Mandir at Somnath too is a miracle of architecture and sculpture. The Rann of Kutch is a geological wonder as the white sandy expanse endlessly stretches under the starlit sky. 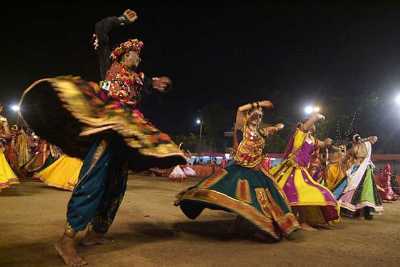 To celebrate the culture and flavour of this region, an annual festival of music, dance and culinary talent called Rannutsav is held in winter between November and February. Guests stay in luxury tents in the middle of the desert and enjoy traditional Gujarati music, dances and food as well as exciting desert activities like camel rides, paramotoring and cart rides. For those who wish to take in the silence and peace of the desert, there are yoga and meditation routines too. The beautiful scenery and plenty of time to relax make it a destination for families, friends and photographers. The Wildlife of Gujarat includes some of the rarest and most endangered animals in the world. The most famous denizen being the Asiatic Lion whose home in Gir National Park is the last wild sanctuary for this animal. The habitat of Kutch is home to black bucks, hyenas, wild asses and scores of migratory birds who make their way to the flatlands and marshes of Gujarat from all over the world. This includes flamingos, different types of ducks, sea gulls and Arctic Terns who fly there all the way from the North Pole. The Jamnagar Marine Sanctuary is the first of its kind in India and is famous for the shallow lagoons where tourists can spot amazing animals like sting rays and rock fish while casually strolling through ankle deep water. The western state of Gujarat has a long coastline of 1660 kilometres and is one of the most diverse states in the country. The topography varies from dense forests to grasslands, deserts, marshlands, mangroves and coastal habitats that are home to a large number of marine animals. The capital city is Gandhinagar and Ahmadabad, Vadodara, Surat and Rajkot are the other main towns. It shares a border with three other states - Maharashtra, Madhya Pradesh and Rajasthan and also shares an international boundary with Pakistan along the Rann of Kutch. Many major ports like Kandla and Porbandar are located in this state, and it also has one of the largest ship-breaking yards in the world. In terms of religion majority of the Gujaratis are Hindus, Muslims and Jains. They speak Gujrati, Urdu and Sindhi which are the most important and widely spoken languages. The people of Gujarat are known for their being professionally businessmen. A vast majority of Gujaratis own their own business whether big or small. Famous businessmen and Industrialists have risen on an international scale managing hotels and industries from this state. The people belonging to the Jain community are known for their textile and chemical mills. The Jains have always been interested in temples and charities like schools and religious trusts. Gujrat is known for its culture. The Charans and Gadhavis are communities who have managed to pass along the knowledge of folk music and folk arts through generations. These folk songs are in the form of lullaby, Nuptial songs, festive songs and Rannade songs. The folk dances and songs are adorned by the folk instruments. A number of big and small fairs and festivals are observed through the year based on lunar or solar eclipse calendar. People of different caste and religion celebrate together with enthusiasm and devotion. The Kites, the decoration, the local stalls blended with the kirtans, bhajans and dances represent the true tradition of Gujarat. The strategic location and abundance of natural resources in Gujarat have made this region a popular port time for thousands of years, and the area has been continuously inhabited since the Indus Valley Civilisation. Many successive dynasties like the Mauryas, Satavahanas, Guptas, Chalukyas, Rashtrakutas and Palas have built cities and monuments in this region. The rulers of the Delhi Sultanate too annexed this town to develop the port there, and the temple of Somnath which was famous for its immense wealth of gold was looted several times for this gold. The Mughals installed subsidiaries in this region and Surat was famously annexed by Shivaji in the 17th century. The British too controlled this region, and during the early 19th century, it emerged as a major centre of textile production. The land of Gandhiji saw vigorous activity during the struggle for independence and the present day state of Gujarat was formed on 1 May 1960. Gujarat's food is as vibrant, distinct and colorful as the cultures here with countless elaborate styles of cooking and unique dishes that are enjoyed all over. The traditional local food gives the sparkling state a unique tint of its own.